I know that as writers we have to be impartial (Ha!) and not have a rooting interest, but I must say that I’m so thankful to see Messi score a goal in this year’s world cup. Not that I have a rooting interest in seeing Argentina stroll through the tournament, but rather because I was so tired of seeing the angle of Lionel Messi’s legacy being questioned because of the troubles of basing a value on a player on a small sample size tournament. Lionel Messi if he retired today would be one of the greatest, if not the greatest player that the history of football has seen even with what happens in the tournament. He has done everything that has been able to be accomplished in Europe, headlining one of the greatest club teams in modern football while coming through in multiple big game performances. It’s silly to question whether he had what it takes to win “the big one”, ignoring how despite the lineage that the World Cup has, the best and highest quality of football currently is the Champions League where Messi has shined like no other. It also ignores that Messi performed quite admirably in South Africa despite not scoring a goal. All of that though can be put aside for at least one night. Messi has put his name on the score sheet in Brazil 2014, and Argentina got the desired result though debutants Bosnia & Herzegovina certainly didn’t make it easy. The substitution of Rodriguez for Higuain allowed for Argentina to break out their more customary 4-3-3 formation and have the field open up for their delight. In comparison to Brazil and Chile, Argentina don’t play at a breakneck pace. They’re almost like cobra’s just waiting for their chance to pounce. They pressed selectively vs Bosnia (which in of itself is very un-South American) and choose to con you into a false sense of security on the defensive prowess that is being used against them. Messi’s goal was an illustration to that sort of thinking, as the right amount of link up play for Messi and Higuain’s abilities to draw defenders as the top class striker he is proved too much. Going forward will present some questions. Rodriguez was not helpful in terms of spacing and it felt more than anything that Messi was having to make up for him and his placement as a left centerman, with Argentina being more stifled in their less favored 5-3-2. Higuain still isn’t fully fit from his ankle injury and starting him when he’s not fully fit is an obvious risk. Perhaps Lavezzi would be the better choice to this and Argentina play with Messi as a false nine. Argentina weren’t perfect though. 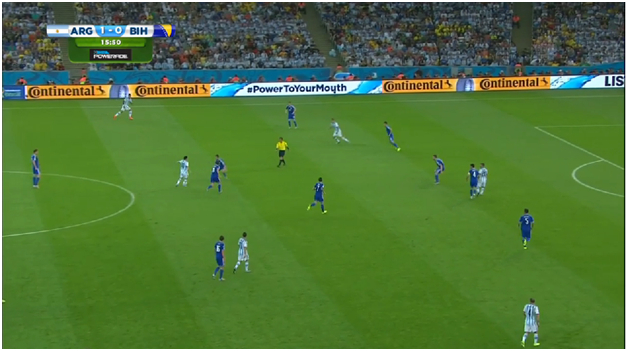 Bosnia created half chances and were able to cross pass midfield and into the attacking third in spurts rather easily. Ibesevic’s goal was the prime example as he made a run past Federico Fernandez with the Argentinean goalie having a five hole bigger than the Grand Canyon. The theme of the World Cup so far has been suspect back lines, which is helping the increase in goals in 2014. Argentina aren’t the most solid in the back and actually were much more pragmatic when they were forced to go with their 5-3-2. They didn’t do much to quell those concerns but that won’t be the headliner from their opening match. Lionel Messi scored for the first time in the World Cup since 2006 and for one night at least, the questions regarding Lionel Messi’s legacy can be put to rest. The king has arrived and took his rightful throne in style.